Are you a doodler? A tinkerer? A drawer of dragons, or a photoshopper of faces? 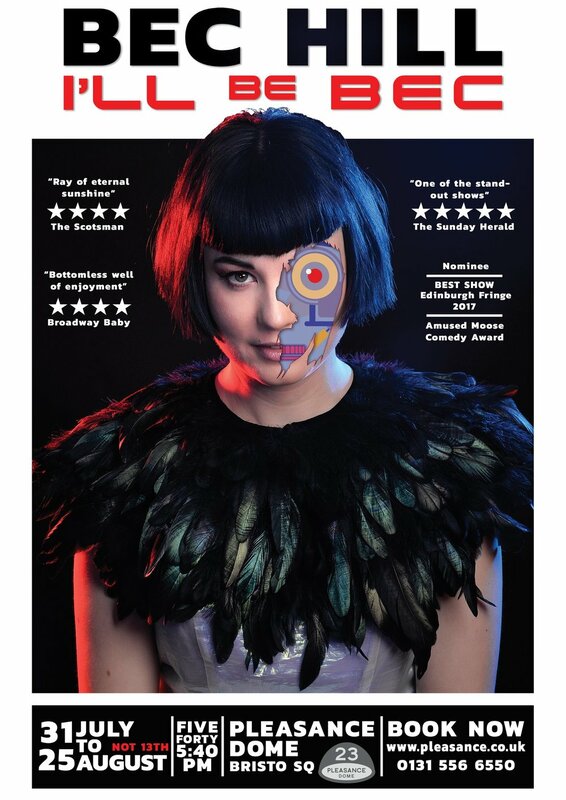 Fancy helping me sell my show at Edinburgh Fringe? 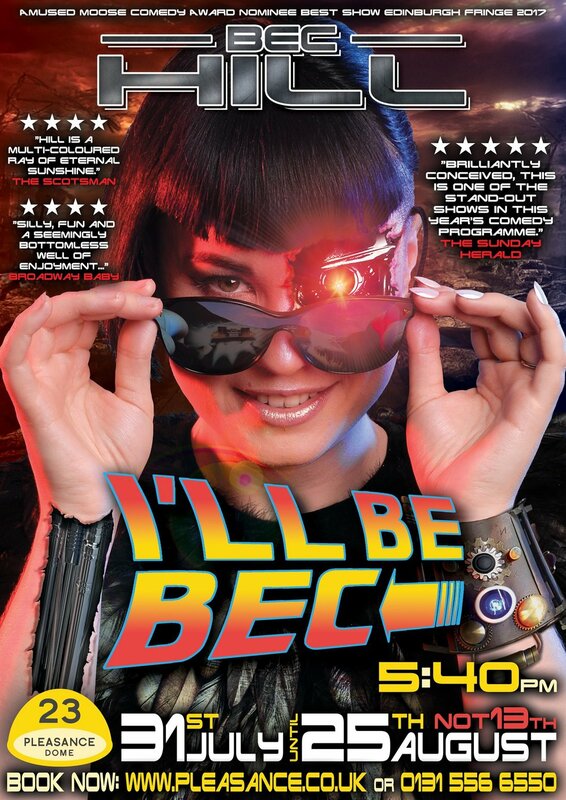 Then I’m inviting you to have a go at designing the poster for my 2019 Edinburgh Fringe show: I’ll Be Bec! This is just a fun marketing experiment and a chance for the public (and me!) to see your creativity, but I will happily pay £200 to the design I use in Edinburgh and £50 each to the most shared designs on Twitter and Facebook. That’s up to £300! No previous experience is necessary! To share your favourite design, click the image to be taken to the original Facebook post! To RT your favourite design, click the image to be taken to the original tweet! 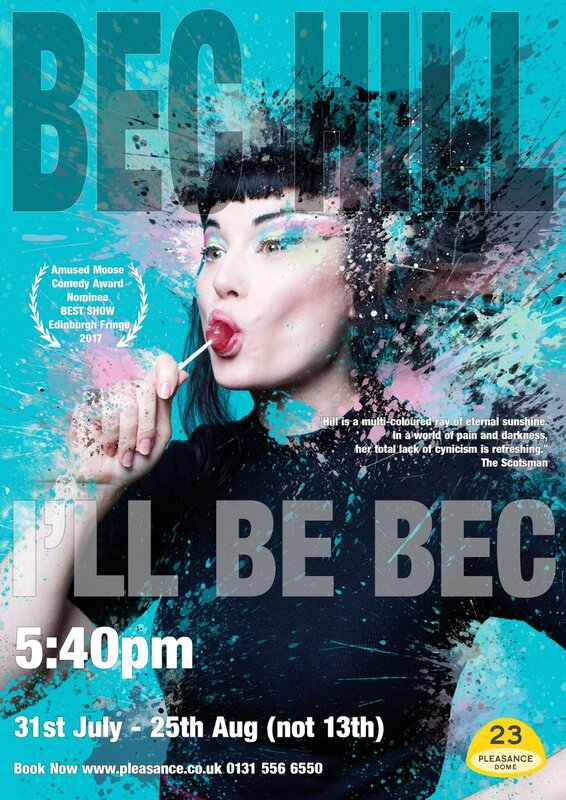 To enter, upload a JPEG version of your poster design to Facebook and/or Twitter and tag Bec Hill (@bechillcomedian on both Twitter and Facebook) in the image. 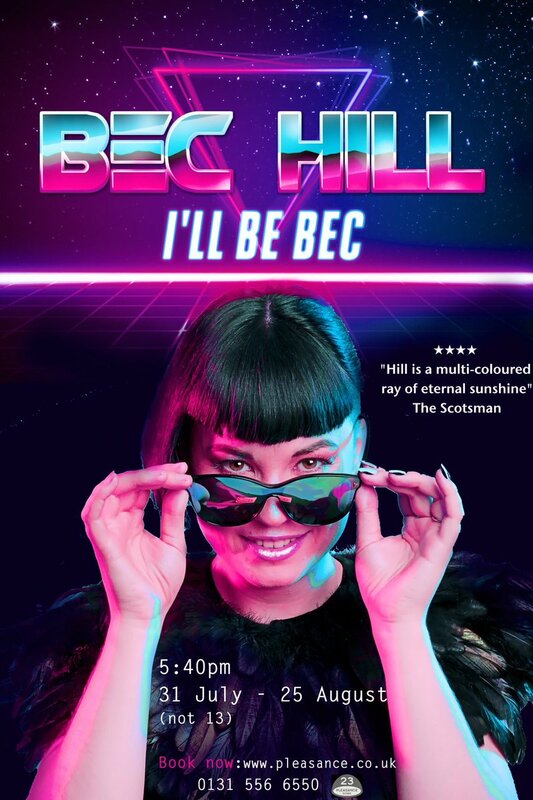 If tweeting, it MUST include a clickable ticket link for the show: https://www.pleasance.co.uk/event/bec-hill-ill-be-bec. 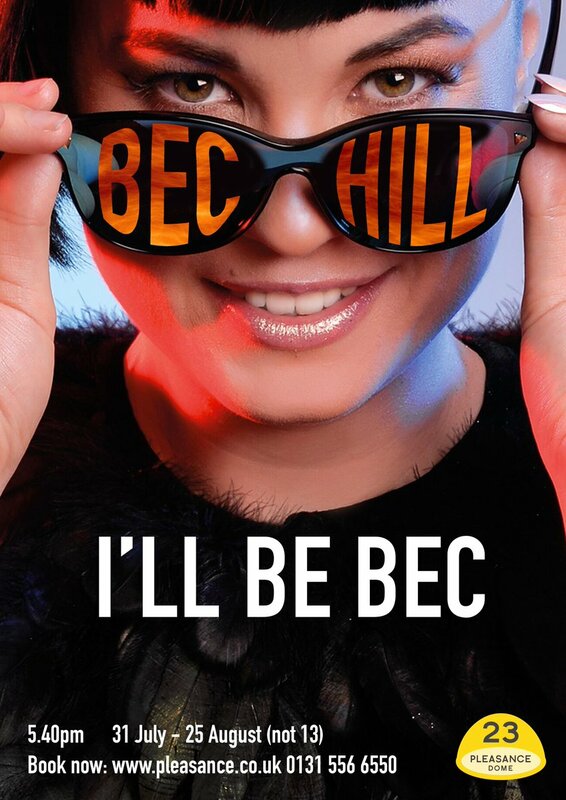 Please ensure that you follow Bec Hill on Twitter (https://twitter.com/bechillcomedian), or already like her Facebook Page https://www.facebook.com/bechillcomedian), to ensure that she is notified when you tag her. You can enter at any point before the competition ends. You can enter as many different designs as you wish, but they must be separate. They cannot all be in the same tweet/facebook post. The design itself is completely up to the entrant, but high-res ready-to-use images can be downloaded from this folder. 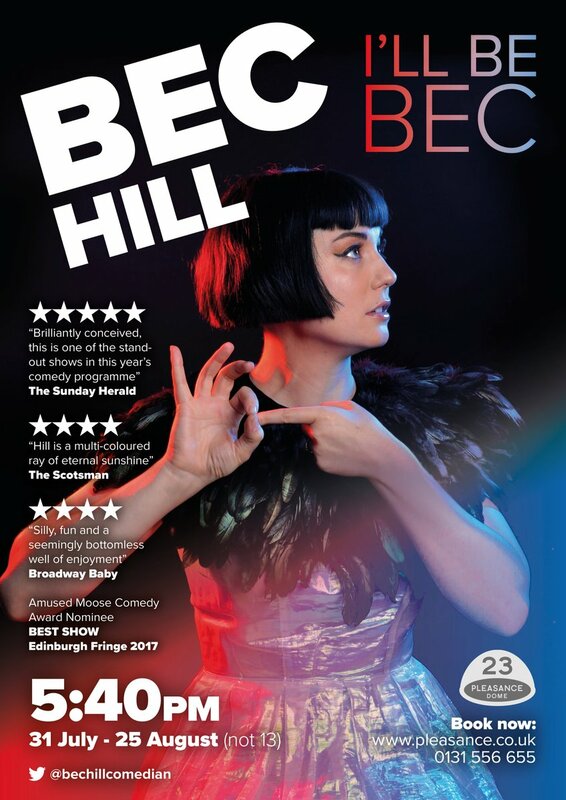 ★★★★★ "Brilliantly conceived, this is one of the stand-out shows in this year's comedy programme." You can also include any other information/graphics you think are necessary or will help sell the show (without spoilers if you have seen it), as long as it is truthful. Winner/s will be paid via bank transfer or PayPal. International winner/s can ONLY be paid via PayPal and will not include any conversion fees incurred by PayPal. Once chosen, will need to be available as an A3 (portrait layout) high-res print-ready PDF file, including bleed and crop marks. May be subject to reasonable and minor edit requests (for example: spelling errors). 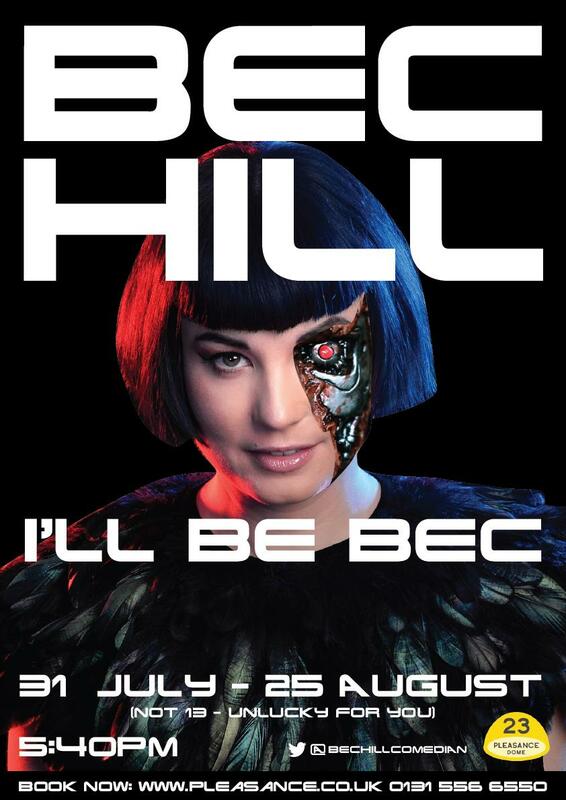 Will be chosen at Bec Hill’s discretion. Will be awarded to the person whose tweeted poster gains the most retweets by the end of the competition. To avoid confusion or dispute, the winner will be decided on how many times THE ORIGINAL TWEET has been retweeted and does not count quoted tweets. It is not possible to combine retweets from several tweets. Does not need to be portrait dimensions, but other dimensions may disqualify it from being considered for the Winning Poster prize. Will be shared on social media with credit. Will be awarded to the person whose poster design gains the most shares on Facebook by the end of the competition. To avoid confusion or dispute, the winner will be decided on how many times THE ORIGINAL uploaded post is shared. I prefer that my name is bigger than the title. People should always remember my name more than my title. The show’s theme is “the future”. Think about what might make the poster stand out next to all the other posters it will be beside. Think about what sort of image might grab your attention on social media. An eye-catching poster with the minimum amount of information on it is better than a boring poster with far too much to read on it. On Twitter, if you put the tag at the beginning of the tweet, it can sometimes limit the amount of people who see it. This may hinder your chances of it being shared by your followers. To be safe, put the tag later or at the end of the tweet. Please feel free to contact me if you have questions about the design which aren’t answered on this page. 8th April, 2019: The competition description has been amended to provide further guidance, but this does not change the competition parameters.